I am the primary trainer and coach here at Angels Landing Farm. Falling out of the womb neighing, the inherent DNA from previous generations had its way with my destiny. On my first pony at 4 years old, my riding career on the East Coast morphed into the 3-Day Eventing world. Schooling with world class and / or Olympic riders, riding cross county, competitive Hunter trials and being on the Board of Directors of an exclusive 300-mile private trail system for the pleasure of local riders, was the strategic beginning in an unfolding journey. A period of years was spent “catch riding” at a Boarding School run by a former member of the Spanish riding School. Catch riding and schooling horses through college was an intense focus as well. It was during this time I met and became coached by a former young assistant rider to Reiner Klimke who was training in Dressage and Jumpers at a nearby facility. This is where the love of correct flat work was really discovered and experienced. It became clear that unless a horse was properly developed and correctly schooled on the flat, the competitive edge became one of chance instead of intention. This mentorship went on for 3 years and was a very meaningful turning point. Relocating to Santa Barbara a few years later opened new doors and opportunities. From here the years ensued with a myriad of trainers and teachers all adding to the whole. Lafayette Lord , Rhinelander Stallion, trained to Grand Prix by Ingrid Klimke, imported for Alix from Germany. Lafayette Lord with Alix in a lesson. Xadrez Do Ratiro, Lusitano Stallion, imported from Brazil. The eventual move to the Santa Ynez Valley in 1997 is where the most impactful education began. 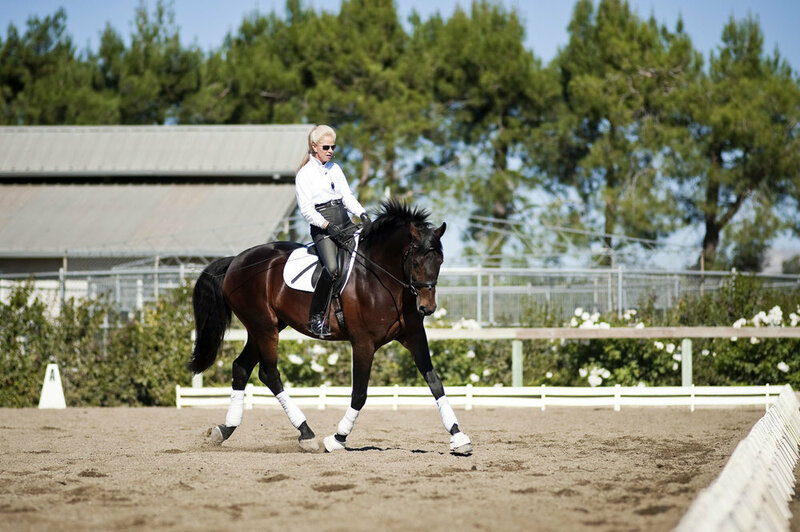 We started hosting monthly clinics, sometimes a week long in length, with some of the world’s most notable and best International teachers in the discipline of Dressage. In 2002 I received an invitation from the First Chief Rider of the Spanish Riding School to study and train in Vienna. This was a memorable trip! My future sponsor showed up in my life at this time and the journey really began to unfold. Over the next few years, numerous forays were made to Europe in search of a world class horse to purchase..all to expand the educational process. A turning point: One of the most important teachers and clinicians to appear at the farm was a well known international Veterinarian from Germany who was challenging the training methodologies worldwide at the highest levels in the show world. He posed two very important questions: 1) Why was the current training modality being used throughout Europe and the States damaging so many horses and 2) Is it sympathetic to the nature of the horse? The light bulb lit and in this moment a journey previously focused on the show world became now a journey to rehabilitative riding. In so many ways, this earmarked a 180 degree change in direction and purpose here at Angels Landing Farm. At the same time another “Professor” showed up who taught a system that made it possible to ride correct Dressage in a rehabilitative manner allowing the horse to develop, stay sound, supple and strong. We brought her in for the next 4 years every other month for 7 to 10 days at a stretch. She demonstrated and taught a very different system which trained and emphasised development of the horse and rider that was not currently being taught in the States. It works. On every horse, every time. The Farm’s focus is based on a Supple, Stretch, and Strengthen concept. Horse and Rider. Life can do that sometimes. The best and most meaningful teachers show up when the question becomes clarified and asked: Can Dressage be ridden in a way that does not breakdown the horse, but teaches the rider to more deeply understand the process of development of the horses’ bodies and musculature? It can, but there must be certain things in put in place, first in this development of the horse’s body (Supple, Stretch and Strengthen) and then in developing their Breathing. These two stages need to be in place before the next stage can be sought. There are no short cuts. I give eternal thanks to those who clarified these concepts for me. When the student is ready, the Teacher arrives. A lifetime quest for knowledge led to understanding proper training which is sympathetic to the horse. Led to honoring an ethic of the horses' well being first and foremost. This is what we are about at Angels Landing Farm. The people and horses here are seeking a different avenue to partner with and steward their horse. For more detailed information, contact me directly. Carey Kendall was introduced to horses and riding at the age of five; an older cavalry instructor instilled a respect and love of the equine at a very early age which continued as a thread through his life. In fact he met Alix through a common friend, at all places? In a barn of course! In his late teens he was living in England and spent much time at a friend’s family farm outside of London. There, the image of country living was instilled and it took he and Alix the next 30 years to finally put in reality that life with the purchase of an amazing 10 acres in Los Olivos, California. He put a 30 year career in real estate to use in picking a sublime location and there he and Alix committed to build out their home and a home for their equine family members. He maintains a very active real estate career from Montecito to Santa Ynez Valley, selling ranches, vineyards / wineries and homes / estates, all the while knowing his wife is safe and happy, along with all their animal family!